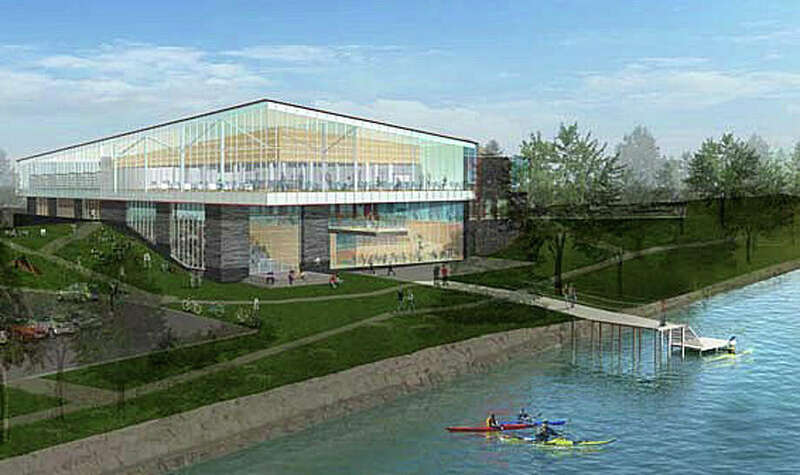 An architect's rendering of a conceptual proposal for the expanded and rebuilt Westport Library. Westport Library patrons take note. When the planned expansion of library gets underway, the building will be closed to the public for two years. That's the word from Library Director Maxine Bleiweis as she discussed the evolving, estimated $25 million project Monday at a special meeting of the Downtown Steering Committee. Final plans for the expansion/reconstruction of the building have not been filed or approved, so the start date for construction is not certain. She said it is expected to take about 18 months from "shovel in the ground" until the work is complete. "While we are under construction, we would relocate to a place to be determined and operate there while construction proceeds," Bleiweis said Tuesday. For example, she noted, "The Ridgefield Library just completed their construction and relocation from a former grocery store. It's a common procedure depending on what needs to be done to a building,"
The expansion isn't just an add-on to the existing building, but uses the current structure as a base. The plan calls for expanding the library footprint about 35 feet on Jesup Green. "We will incorporate the existing building," Henry Myerberg, project architect, explained Monday night. For example, the existing circulation area will become a "tiered-down" space to the riverwalk, he said.. The permit process for the proposed expansion has started, Bleiweis said at Monday's meeting, adding they are in the "early stages of fundraising." While it has been estimated the expansion could cost about $25 million, Bleiweis said Tuesday that "everything is in preliminary stages, so until we have engaged more consultants in the process and gone through permission and estimating, there is nothing to release." She said, "It's all very complex as we balance needs with resources." In February, the Planning and Zoning Commission approved a land-use report for the project, allowing the library to move forward with the planned 35 foot expansion onto Jesup Green. The expansion, according to a general outline of the plan presented at that time, would include an additional 12,654 square feet to the existing 43,916 square foot building, as well as some changes to the surrounding landscape and parking. More space is needed to accommodate the more than 1,200 people who visit the library daily on average and for the many programs offered there.